During winter, it’s unlikely that you spent much time gardening, so you’ll probably find layers of dead twigs, leaves and others types of weeds that make your backyard unsuitable for summer. Cleaning your garden is the first step towards enjoying a plush green space. You will need to use a rake, brush and other gardening tools to remove all accumulated debris. Kill garden weeds by using trowels and hoes to dig into deeper roots and clear off all unwanted layers before mowing the grass on your lawn. Once you have finished removing loose debris, leaves and weed from your garden, you’ll probably want to replenish the lost nutrients in the soil by adding some fertilisers. 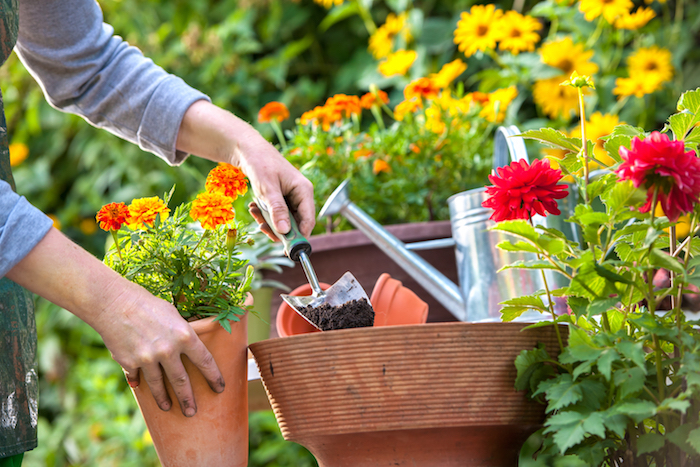 You can easily work the fertiliser into the soil using a spade to help your plants grow beautifully as summer arrives. Before applying fertiliser, you may want to get your soil tested, so you can select the right formula for your individual soil conditions and plant needs. You can also get the recommendations of your local nursery when choosing fertilisers for your specific soil conditions. Mulching is an excellent way to prevent water from running away on your soil, while providing an insulation layer to protect soil from sun and heat. The mulch layer prevents the evaporation of moisture into the air, allowing it to seep into plants so they can grow beautifully in summer. Mulch also prevents weeds from growing and destroying your plants. It can be made from any type of organic matters; shredded wood, grass clippings and dried leaves. Know what flowers are best suited to summer, so you can spring your garden to life when you enjoy your outdoor space. Summer bulbs like dahlias, lillies, gardenias, bouganvillias and lavenders provide beautiful colour and drama to your landscape throughout the summer. These flowers usually require plenty of natural sunlight, making them excellent choices for your summer garden. Watering plants regularly will penetrate deeply into the roots, allowing them to absorb all the moisture they need to grow properly. Make sure you water your plants early in the morning or late in the evening to retain water as much as possible. Avoid watering plants during hot afternoons because water will evaporate quicker and your plants won’t get the nutrients and moisture they need to survive. Take care not to over saturate your plants while watering because they can get damaged if you’re not careful. Need some advice on how you can spruce up the garden or backyard in your Eastern Suburbs investment property? Reach out to the team at Murray Property who can give you some advice on the types of plants to choose for rental properties to ensure they are low maintenance for tenants and easy to upkeep.